Diskpart lets you manage discs, such as format and partition them. 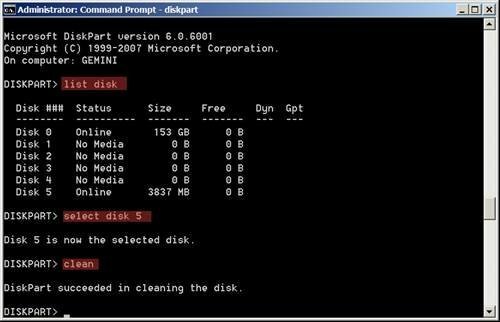 By typing "list", you will see a list of the disks on your PC. Here I'm running Diskpart on a second PC (not the Lenovo S10). On my machine disk 5 is the 4 GB SanDisk USB memory stick. Important: you must select the USB memory stick before going any further otherwise you'll damage the main disk on your PC and overwrite the file system. To select the USB memory stick on my PC I type in "select disk 5". The drive number for your USB memory stick will be different so make sure you check and double check! When you are absolutely certain you have the USB memory stick selected type "clean" to wipe the disk.